Value Investing in Real Estate outlines a safe and rewarding way to plan for your retirement and increase your income without the risks so common to the stock market. You'll learn how to buy real estate properties using Ben Graham's time-tested methods for evaluating investments. It's a proven way to build assets and income-a big payoff for relatively little time and effort. This book proves the advantages of value investing in real estate as compared to stocks in terms of stability, yield, growth, and equity appreciation. 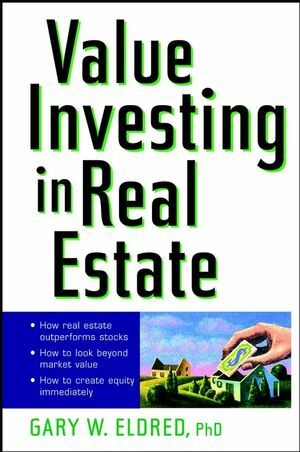 Value Investing in Real Estate also guides readers through important topics such as identifying geographical areas of growth, population patterns, land use, market indicators, condos, townhouses, fixer-uppers, and conversions. It covers what you need to know about both value investing and the real estate market-and how to combine the two for high returns-all backed with examples that illustrate each concept and technique. For the great majority of enterprising investors, value investing in real estate will prove superior to the stock market. Most importantly, you will gain far more income than the paltry dividends accruing from most stock portfolios. With this intelligent, highly readable book, you will see how the techniques of value investing in real estate can help you build the wealth and income you will need in the future. GARY W. ELDRED, PhD, has worked as a real estate investor and as a consultant to industry for more than twenty years. In addition, he has taught MBA courses in both finance and real estate at leading colleges such as Stanford University, the University of Virginia, and the University of Illinois. Professor Eldred has previously authored dozens of academic and professional journal articles and ten books, including Yes! You Can Own the Home You Want, The 106 Common Mistakes Homebuyers Make (and How to Avoid Them), Second Edition, and Investing in Real Estate, Third Edition (with Andrew McLean), all published by Wiley. Introduction: Rethink Your Financial Future. Value Investing: The One Best Way. The Case Against Stocks for Retirement. The Case for Real Estate. Real Estate Risks and Returns. The Ins and Outs of Market Value. Is the Property a Good Buy? Conclusion: You (Not Everybody) Ought to Be Rich.